Cosmos 2 - Acrylic on Panel, 16 x 16 x 2"
The paintings are out the door. We had to drive to the local airport to send the box out via Fedex — a quick scenic trip across the river. Half an hour in light traffic, even though it was rush hour. I still marvel at small town life. Here is another one. 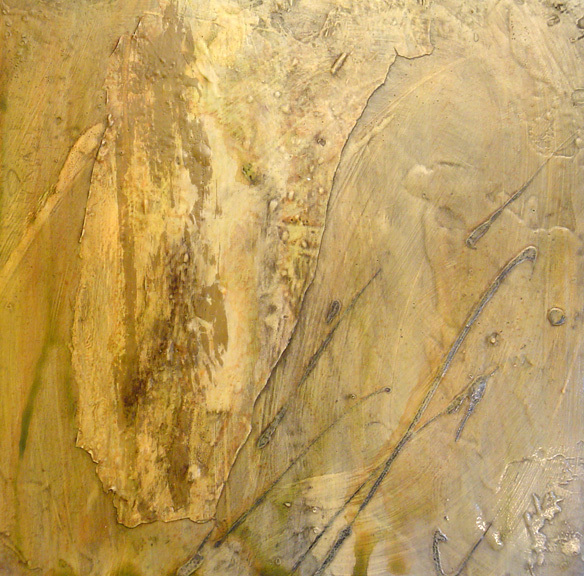 The color palette for the series is subdued, earthy, the colors of ash and minerals. These colors were requested by the gallery, but they are ones that I enjoy working with. They remind me of natural formations and the effects of the elements on manmade structures. I hope everyone has a great weekend planned. Mine will be a welcome break from working on this project. As soon as I take a breather, I need to clean up the studio again. Very beautiful Martha. Looks exactly like the stoney clifts you see on a drive in the country. Well Sherrill, I hadn’t thought about that, but you’re right! Just yesterday I was staring at some rocks stacked up in a chimney. The next thing you know I was imagining paintings. Lovely blend of colour and texture. Thank you, Sandra. Not always easy to pull off. And I enjoy having you stop by, Mary Fran! Thanks for taking a peek. Your textures and colors are so sophisticated, Martha. I’ve never worked on twelve paintings at once before, so your talent is exponentially multiplied in my book. I walk on air after completing only one or two paintings, so I hope you’ll rejoin us here on earth soon. Thank you DJ. It’s a juggling act to work on so many at once. I don’t usually do that, but this was a commission. In some ways, it’s a good way to work with a lot of textures, because so many things take a long time to dry. That way I have one or two that I can always be working on.